The choice of feed outlet is crucial for making sure all roots are adequately fed. The decision will depend upon factors such as system type, system volume and flow rate requirements. 1. Bare hose end: Blockages are least likely. This is the preferable method for NFT or any system where the outlet flow does not need to be sprayed or tightly regulated. If needed, the flow rate is adjustable via an in-line tap. 2. Flood & Drain: Specific to ‘Flood & Drain’ systems. 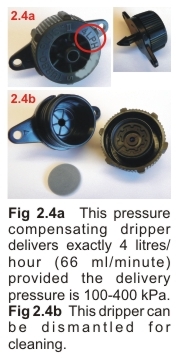 ● “Pressure compensating” drippers deliver a preset flow rate (Fig 2.4). These are ideal for run-to-waste systems for obtaining a specific percentage run-off (see Table 9.20). ● “Adjustable” drippers permit the flow rate to be adjusted. However, because these are ‘non’ pressure compensating, their output will vary with delivery pressure. ● Drippers are prone to blocking therefore make sure they can be dismantled for routine cleaning (Fig 2.4b). 4. Sprayers / Jets: (Fig 2.5) Use these when top-feeding to achieve an even distribution of nutrient over the surface of pots. However, note that they are prone to blockage, and will increase evaporation losses and salt build-up. In run-to-waste systems it is often necessary to obtain the same flow rate from each feed outlet. This can be achieved by using “pressure compensating” drippers. These will yield a preset flow rate (Fig 2.4). They are however, not always desirable because they are susceptible to blockages. 1. Use maximum diameter piping for the primary circuit. 2. Pipes joining the primary circuit to the feed outlets must be of equal length and diameter. Note that using wider pipes will reduce the need for being consistent with this requirement. 3. Feed outlets must be of equal type and specification. Ensure the outlets are maintained to avoid partial blockages. Partial blockages will distort outlet flow rates.